Born and raised in Germany, Hans Krebs followed in his father's footsteps, setting up his medical practice and specializing in eye, ear, nose, and throat ailments. He became more interested in research than treating patients, studied under Otto Warburg, and in 1932 he discovered the urea cycle (reactions in animal organisms, producing urea from ammonia). He fled to England in 1933, when the Nazis took power and Krebs, being Jewish, was denied academic employment. In 1937, working at the University of Sheffield, Krebs researched and described the chemical reactions that occur in the presence of oxygen as substances formed by the breakdown of sugars, fats, and protein components are converted to carbon dioxide, water, and other compounds. These recurring reactions are now commonly known as the Krebs cycle. 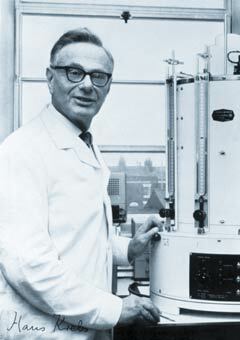 This discovery led to the Nobel Prize in Medicine, shared with the American Fritz Lipmann in 1953. His son, Sir John Krebs, is a noted ornithologist, professor at Oxford, and member of the British House of Lords. Krebs is not related to another German-born Hans Krebs of the same era (1898-1945), a Nazi military General who committed suicide in his bunker as World War II ended.